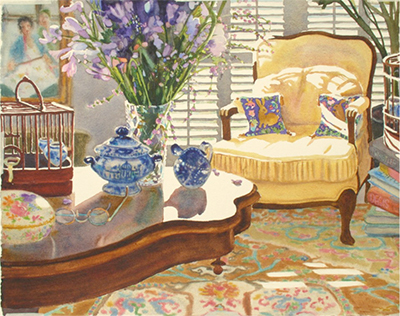 Upon witnessing and experiencing the rich, dynamic and light-filled compositions in the watercolor paintings of Patricia Hansen, one is drawn into this beautiful and thought-provoking series of work. The mastery of this medium by the artist demonstrates the confident fluidity and freshness present in each painting. As with most significant works in art and literature, the artist can translate the complex and transform it into a clear, obvious, powerful and beautiful piece for all others to share and experience. Hansen, unafraid to veer off the purist tract, intermingles nontraditional techniques, such as working wet-into-wet and scumbling, with otherwise established watercolor customs. Moreover, moments before completion, knowing that watercolor is an inherently unforgiving medium, she is willing to risk impair by going back into unresolved areas to muddy and scrub painting to conclusion. By glazing and layering burnt sienna and ochers, Hansen creates a rich depth and earthly warmth that keep the lovely, sweetly-evocative watercolor paintings from crossing the line to the ethereal. Very much in the spirit of Edouard Vuillard (French Nabis painter of 1868-1940), Patricia Hansen portrays intimate, contemplative spaces corners of tea rooms, areas of sitting rooms, glimpses of bedrooms and views from windows. 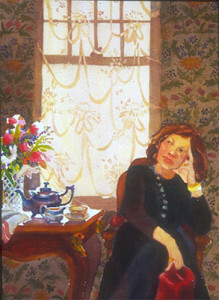 Like Vuillard, she transforms everyday interior spaces into tableaux of beauty and grace. Her complex surface patterns and emotionally luminescent compositions record both transitory moments and commonplace events of quietly-led lives. A stack of books beside an almost Vermeer-yellow chair, the shutter-filtered light streaming across polished tables and hand-knotted rugs and the abundance of fresh flowers yield an eloquent, elegant body of work, a carefully composed, superbly constructed and beautifully integrated synthesis of art and life, spirit and material. 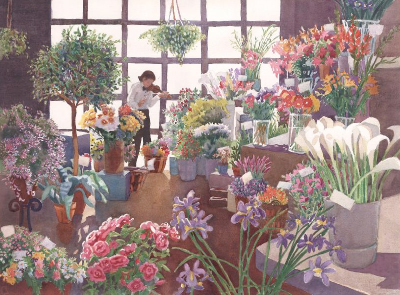 Her paintings will hold some viewers enthrall with its eclectic decorative totality. For those weary of the bounce-around life, Hansen’s comforting and comfortable scenes may stir a longing for home. For others, the work might evoke a calm, warm and secure honey-sweet, September 10th kind of day. For me, Hansen paints the scent of Earl Grey tea and the sound of slow, cool Brubeck number playing low in the background—a Paul Desmond melody flying smooth off the alto sax. 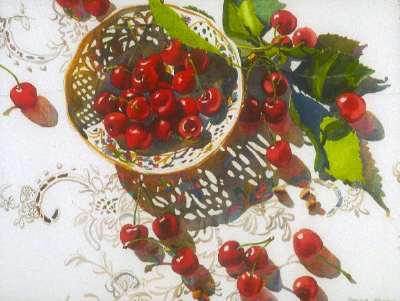 Unequivocally, Patricia Hansen, through the activity of painting and grace of vision, has offered us a wellspring of sensory delight.